The public defense of the doctoral thesis presented by Giuseppe Peronato, entitled "Urban planning support based on the photovoltaic potential of buildings: a multi-scenario ranking system", took place on January 24 2019 at the Ecole polytechnique fédérale de Lausanne (EPFL). Conducted at the Laboratory of Integrated Performance in Design (LIPID) under the supervision of Professors Marilyne Andersen and Emmanuel Rey, this research focuses on the development of a planning-support system based on the photovoltaic (PV) potential of buildings. The goal is to provide decision-makers and stakeholders with a robust method to assess the potential of photovoltaic electricity generation of existing buildings under uncertain environmental conditions. The doctoral work was realized in the framework of the ACTIVE INTERFACES interdisciplinary research project carried out within the PNR 70 of the Swiss National Science Foundation (SNSF), which aims to develop new strategies for the implementation of BIPV in urban renewal processes. The developed methodology is based on an urban-scale modeling workflow that includes the simulation of the photovoltaic electricity production and a simplified estimation of the building energy retrofit potential. Existing state-of-the-art models for solar radiation, building energy and PV performance are coupled in the workflow, which relies on a vector 3D city model featuring an accurate representation of buildings, terrain, and vegetation. The proposed modeling workflow also includes an innovative approach for simulating the arrangement of PV modules on the building envelope, which influences both the energy yield and the acceptability of the system. The modeling workflow is in turn integrated into a planning-support system that provides a robust assessment of the photovoltaic potential through risk-averse scenarios. Two crucial yet underestimated uncertainty factors are considered: weather and vegetation. The results are aggregated at different scales and, for each scale, the spatial locations are ranked through pairwise comparisons according to relevant energy indicators. 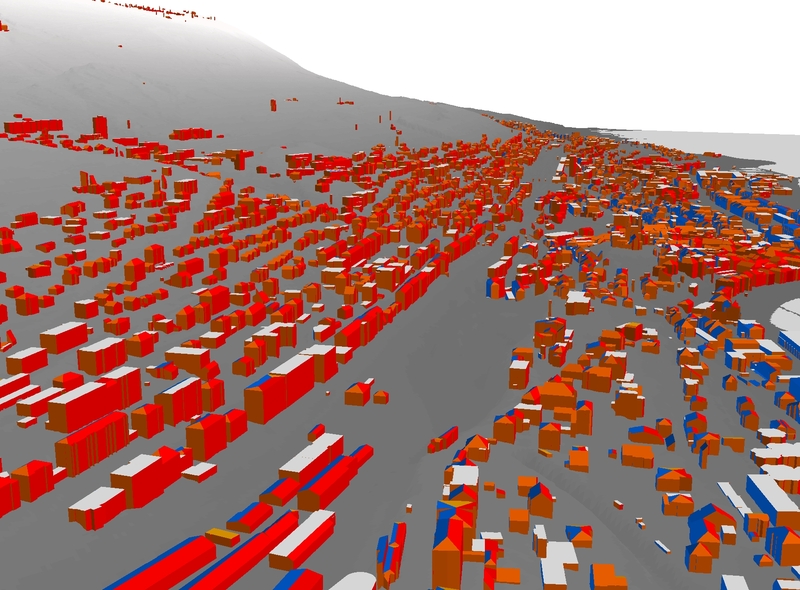 The results are finally displayed in a 3D-mapping tool featuring false-color overlays at the considered aggregation scales to address different objectives and informdecision-makers. Sensitivity analyses towards different input data resolutions and modeling scenarios were conducted so as to achieve a good trade-off between accuracy and computational cost and define confidence intervals for the calculated values. The simulated PV yield was also compared against measured data from an existing PV installation. The proposed modeling workflow and planning-support system were tested in an urban district within the city of Neuchâtel (Switzerland). The analysis highlighted areas with the highest potential and provided a priority list of interventions. It also showed the impact of vegetation on absolute results and especially on the ranking of the spatial locations evaluated by their energy potential.